Universal Pack, since 1965 leader in the construction of stand-alone sachet packaging machinery and complete lines, showcased its latest equipment and technological solutions at the Ipack-Ima 2015 trade exhibition, which took place in Milan, Italy, from May 19th to 22th. This exhibition, which is held every three years, is a leading global event in the packaging industry. Universal Pack proved once again to be one of the leading exhibitors in this seventh edition of the fair, celebrating 50th years in design and manufacture of universal and flexible sachet machinery. 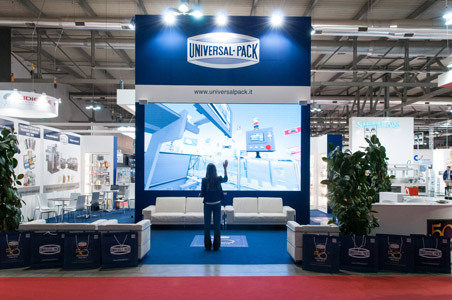 Universal Pack’s presentation at Ipack-Ima 2015 was innovative as an interactive, technological stand demonstrated the company’s commitment towards continual development in both the machines and complete lines. At the Universal Pack stand, visitors had the opportunity to interact and learn more about the complete packaging lines, for Stick-Packs and 4 side seal sachets. By means of a “Dynamic Video Wall” visitors could learn about this equipment, which is fully constructed by Universal Pack, in a fun way. Entering the workings of the machines and packaging lines in this touch-less, virtual manner is an innovation which Universal Pack was the first company to introduce. The overall result from the exhibition was satisfactory for Universal Pack with a good number of visitors and customers from all over the world and an increased number of contacts and global requests.